Venetians are demonstrating against an influx of tourists who are taking a toll on the fragile city. Dozens of Venetians waved maroon and yellow flags and carried empty suitcases on Saturday during a symbolic demonstration to highlight an exodus of residents from the lagoon city, where tourist hordes can make everyday life challenging, Reuters reports. Last week, images and reports of clogged alleyways and narrow streets during All Saints holiday weekend rekindled an ongoing debate about controlling tourism within the city. “Venetians have long complained that food shopping and other daily errands have become increasingly tricky as the city focuses on meeting the needs of the more than 20 million tourists who are estimated to visit it every year,” says Reuters. "This is not a protest against tourism, it's a protest against the policies that the city has followed in the last 40 years," Venetian resident Andrea Castelli tells Reuters. Castello dressed up as the Doge led a procession of people carrying suitcases. Protesters hung a banner that read “#Venexodus” on the Rialto bridge and glued to their trolleys signs that said 'Without Venetians? Don't call me Venice anymore,’ Reuters reports. Congestion from visitors isn’t the only thing upsetting residents. According to Reuters, tourists are also blamed for rising rents and housing prices. "If you add to that the lack of housing for locals and a wild proliferation of accommodation offered to tourists, you can understand that the situation is unbearable for those who live here,” resident Federico Permutti tells Reuters. 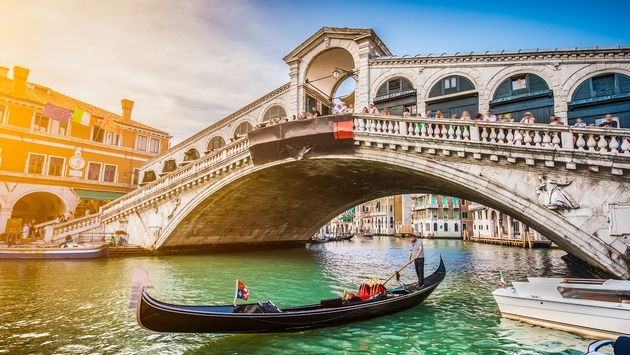 For more on the tourism crisis in Venice, read on here.